The Calendar Events page opens. 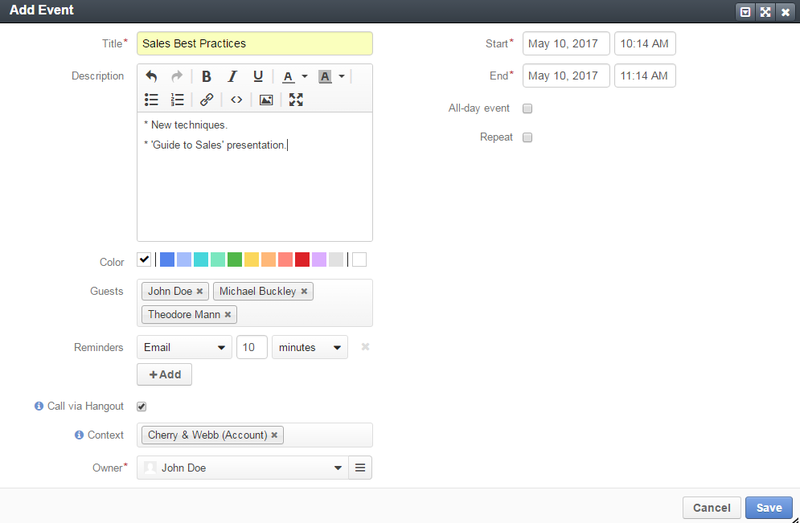 On the Calendar Events page, click the Create Calendar Event button in the upper-right corner of the page. The Create Calendar Event page opens. On the Create Calendar Event page, fill in the required information as described in the Complete Event Information section. Owner—A user who is eligible to manage this event and who is responsible for it. The event appears in the calendar of the owner. By default, a person who creates an event is selected as its owner. Change the owner if required. Select another user from the list. You may use the search field to quickly find the required user: start typing the name of the user to get suggestions and then click the required name. Alternatively, you may click the hamburger menu next to the Owner field and select the owner in the Select Owner dialog box. Title—A name for your calendar event. Description—Any details regarding the event: summary, agenda, etc. Use the embedded editor to format text, add images, links, etc. Color—Select the color to label the event with. The first item is the calendar color and it is selected by default. Click different color to change the setting. 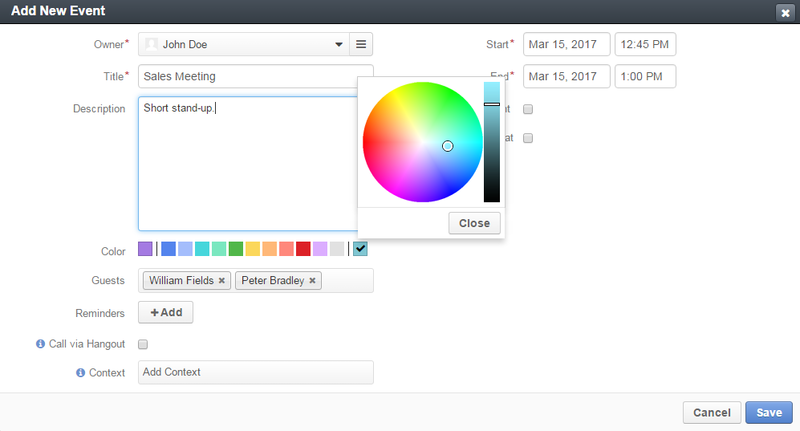 To customize the color using a color picker, click the last color in the line (initially it is blank). Add to … or Calendar—You will see one of these additional settings if any system calendars are defined in the system. Guests—People invited to the event inside and outside your company. Click the field to select n Oro user to the event. To add a person outside your company as a guest, type their email address in the field. The number of guests is not limited. The event appears in the calendar of every invited Oro users. To cancel the invitation, click the x icon next to the guest name. Reminders—A notification about the upcoming event. Call via Hangout—Enable this option to plan a Google Hangout meeting for the calendar event. When enabled, a button that starts Hangout call appears on the event card and view page when viewed by the guest. For Hangouts calls to be possible, an integration with Google services should be created. Contact your administrator or see Google Integration Settings for more information. Context—Select a record that has a meaningful relation to the event. Start entering a record name to quickly find the required user, and when the list of suggestions appears, click the required name to select it. 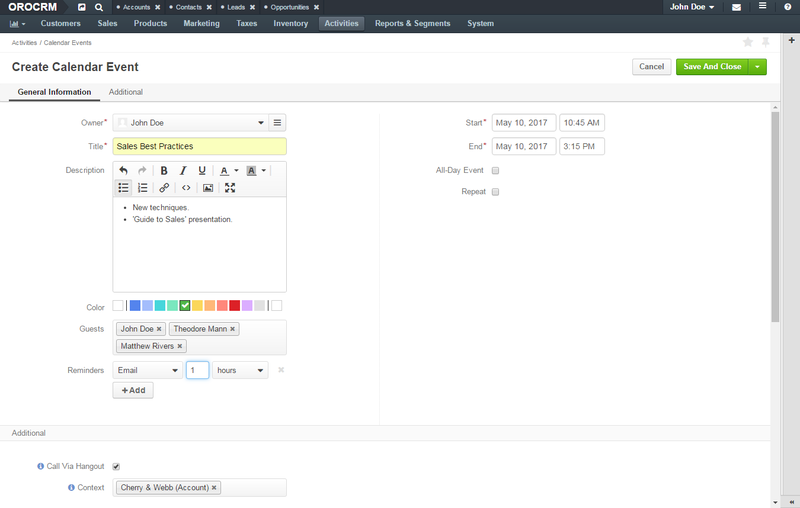 The event is now linked to the selected item and is displayed in its Activity section. Start—Specify day and time when the event starts. Click the day field to select a day in the calendar dialog. Click the time field to select a time from the list. Alternatively, you can type in date and time values. End—Specify day ant time when the event ends. 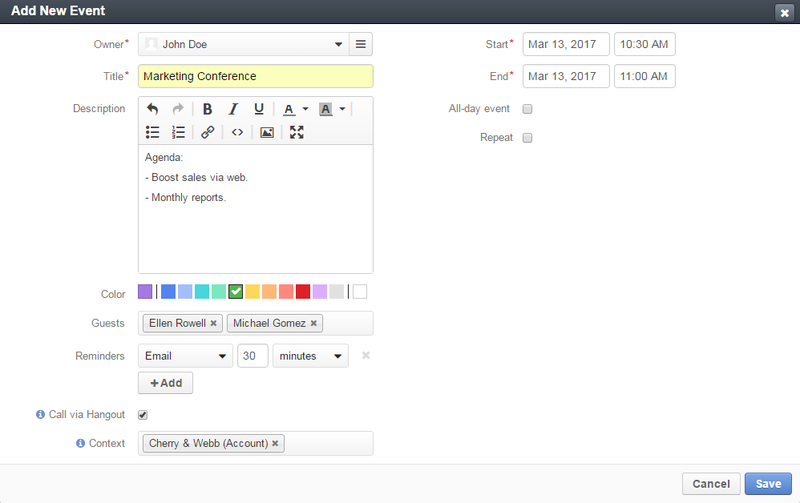 Click the day field to select a day on the calendar dialog. Click the time field to select a time from the list. Alternatively, you can type in date and time values. All-day event—Enable this option to reserve the whole day(s) for the event. Repeat—Enable this option for a recurring event. Once you enable it, you can configure the event schedule as described in the Event Schedule section. You can use the following controls to configure the frequency and schedule of the recurring event. These options are available only when the Repeat option is enabled. For a Daily event: Specify whether an event repeats every weekday or once in several days. In the latter case type the number of days in the corresponding field. For a Weekly event: Specify how often the event repeats (e.g., every 6 weeks) and select the days of the week when the event takes place. For a Monthly event: Specify how often the event repeats (e.g., every 10 months) and select whether it repeats on a certain date of the month or on a particular weekday (e.g. on first Monday, third weekend day). For a Yearly event: Specify how often the event repeats (e.g., every 2 years), select the month and whether it repeats on a certain date of the month or on a particular weekday (e.g., on first Monday, third weekend day). Never—The event does not have any predefined finish conditions. After … occurences—The event repeats the predefined number of times. Specify the required number of times in the corresponding field. By—Select date and time to stop recurring the event. Click the day field to select a day in the calendar dialog. Click the time field to select a time from the list. Alternatively, you can type in the date and time values. By сreating a calendar event from a record view page, you specify that this record relates to the call in some way. On the related entity view page, click More Actions in the upper-right corner of the page and click Add Event on the list. In the Add Event dialog box, specify the required data. For the description of the fields see the Complete Event Information section. You can see the calendar event in the Activity section of the entity view page. Click the empty cell that represents the desired time period. If you are adding an event from the widget, you can alternatively click the New Event button in the upper-right corner of the widget. In the Add Calendar Event dialog box, specify the required data. For the description of the fields see the Complete Event Information section. Click the Save button. The event appears in your calendar if you have specified yourself as an event owner or a guest.